Tip one: Feed puppy food. I realize this sounds obvious, but puppy food is designed and formulated for the specific nutrients needs of a puppy. I will routinely have a pet mom or dad come into my office that was told to feed an adult food to their puppy to slow the growth. This is not advisable. A puppy formulated food is best. Tip Two: Check the label. All dog food manufacturers are required to have a feeding statement on the label. That statement should say one of two things for puppies: “For all life stages” or “for growth and maintenance” of puppies. If this is not on the label, do not feed this food to your puppy. Tip Three: Feed for your breed. Large or giant breeds have different nutritional requirements than a small or medium breed of puppy. Large and giant breeds have higher caloric requirement as well as a calcium to phosphorus ratio than a small to medium breed. 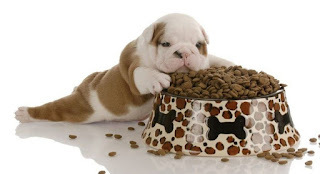 If you feed a large to giant breed puppy a food formulated for a small to medium breed, this can be seriously lacking in the nutritional requirements for your puppy. Tip Four: Feed for body condition. All puppies go through growth phases. They will “grow out” before they “grow up.” What we refer to as “puppy fat.” It is important as you take your puppy into the checkups, we will monitor the growth of your puppy. If they are growing to quick or not quick enough, we will make recommendations on the amount or type of food for your puppy. Tip Five: How much to feed? First, do not look at the manufacturer’s recommendation. Generally, they recommend overfeeding. A good rule of thumb: One cup per 10 pounds per day divided into 3 portions. So, a 10 pound puppy should be fed ¼-1/3 cup three times daily. A 20 lb puppy should be fed ½-2/3 cup three times daily. Keep in mind, this is a general rule. We will look at other factors: energy, body condition, and lifestyle that could affect the amount to feed.